The bullying by Greece’s creditors continues. The latest ploy is to try, unilaterally, to interfere in Greece’s internal politics by re-defining the terms and purpose of Sunday’s referendum. It is patently clear that Tsipras called the referendum to ask the Greek people whether they accepted the latest bailout terms laid down by the creditors, yet the Eurozone 3 – Merkel, Hollande, and Juncker – are now claiming, on no evidence at all, that the referendum is about whether or not Greece wishes to stay in the Euro. It is no such thing. The technical question Greeks have to answer doesn’t even mention the single currency. The Eurozone leaders clearly fear that Syriza will win the referendum, and this clumsy attempt at interference is clearly designed to blackmail Greek voters into accepting the latest terms for a bailout extension. It won’t work. The Eurozone line is that these bailout terms are final and there’s nothing further on offer. But of course that’s not true. They would say that, wouldn’t they? This is an extremely tense negotiation reaching its climax, and the participants will lay down conditions to try by any means to gain a settlement on their terms, saying for good measure that it’s their last offer, only to retreat to new terms and a new offer if their ‘final’ offer is rejected. In this case the cat is already out of the bag. The European Commission stated yesterday – for the first time in this long-drawn-out crisis, that it wanted to offer Greece debt relief. That is precisely what Tsipras has been demanding for 5 months throughout the stalemated negotiations. So why wasn’t this offered 5 months ago, and this whole crisis could have been averted? It wasn’t offered then, and is only being offered now, because the most powerful interests within the Eurozone – the hardliner Merkel and the German banks – were determined to enforce their own principles of ordoliberalism on a compliant European economy, and thought they had the muscle to do so. It is only now when they fear that Tsipras’ latest move means they have lost control of the negotiations that they are hinting in the background that there could after all be a further compromise. Their reason of course is not concern about Greece which has suffered a 25% shrinkage of the economy comparable only to the Great Depression in the US in the 1930s, but rather about the future of their pet project, the Euro, which is the basis of German hegemony in Europe because in the long term no other country in the Eurozone can match German productivity, yet is precluded from regaining equilibrium via interest rate and exchange rate changes. If the long-term unviable Euro is to survive, it must respect democracy equally, or more than, market power and in the immediate short-term re-open negotiations on the essential condition of a partial write-down of Greek debt (which currently at 180% of GDP even the IMF has pronounced is unmanageable) to a level consistent with economic growth (120% of GDP or below). Posted in: Europe, Ideology, International. The Tieless One should resign now and let another Coalition Govt take over, one which will work with the IMF and the ECB. The agenda is so clear even a blind man can see it but why do so many not. The private financiers killed the Euro because whilst it was based on strict `monetarist’ conditions imposed on each member state responsibility for money creation had long since passed into the hands of the bankers and their 30-year ponzi scam/credit bubble. They were churning out bonds based on sub-prime loans in the trillions and using this income to fund even more sub-prime and dodgy lending. When the banks collapsed in 2008 they owed their super rich and corporate creditors who had invested in their junk bonds trillions and trillions of pounds and Euros (American banks owed $34 trillion). The EU makes it a legal requirement for member states to bail out bankrupt banks but Greece never had any chance of covering the debts of their banking system especially as the tax revenue from the bankers’ speculation also collapsed over night. A double whammy if ever there was one. The Greeks had borrowed billions and spent it all on German cars and construction contracts. The bank bail out via austerity is the mechanism by which the greatest redistribution of wealth from poor to rich in human history is taking place. The first thing Syriza should have done when it came to power was not go begging to the ECB and IMF and Putin and trying to create an anti-German atmosphere in Europe but end the bail out of their bankrupt banks. They should then have bought the staff, deposits and estates of these bankrupts into administration and used them for form a new People’s Bank which could lend Euros at basic rate to small business and facilitate social investment. Instead we have this foolish referendum which puts a gun to the heads of the workers and invites them to blow their own heads off. Of course we must vote NO as the proposed austerity will be vicious but in asking workers to vote NO we must offer a viable and radical alternative not just more pointless negotiations with a ruling class and their politicians that are determined to liquidate the real economy in the name of calling in their markers. This is all about the Neo-Liberal agenda, Naomi Klein’s “Shock doctrine” writ large, None of this is happening by accident and the proof is now there for all to see. The ECB is busy bailing out the European Banks using Quantitative Easing, but when it comes to public expenditure or government debt, suddenly we are broke. Well the ECB could in fact write off all the debt in Europe, but deliberately chooses not, in the meantime the private sector are busy using the crisis picking up state and company assets for a song. We need a totally new perspective, where money that is issued free through the Banks is issued directly into the economy to serve people not the corrupt Banks. We can afford our public services, we could create jobs that paid real wages, but that means nationalising the Banks and using money that the private sector refuse to do to fund the needs of people. David – excellent analysis: cracking stuff. 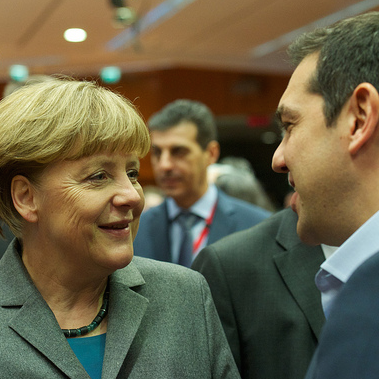 Is there not a contradiction in the idea that the Eurozone should respect Greek sovereignty? Being in the Eurozone implies forfeiting the ability of national governments to use their currency issuing powers in the way Michael Meacher advocates (with god reason) for the UK. This is a key issue so it would be much appreciated if Michael Meacher would respond to the point to explain his view on this apparent conundrum. The Greeks should respect International Agreements and Treaties and Deals that they make with their Creditors; they’ve spent the money, now they want to do a runner. Its like going to the Food Bank, and then whinging that you’re not been given a Fortnum & Mason’s Hamper.